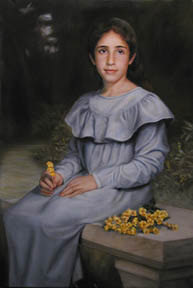 Unlike photographs, which are impermanent, and eventually fade away, an oil portrait is an heirloom to be passed down through the generations. You can see oil portraits in museums that were painted centuries ago and are still in excellent condition. 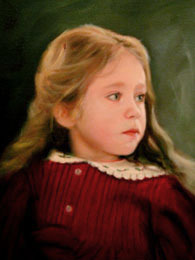 The rich colors and texture of an oil portrait can stand the test of time. 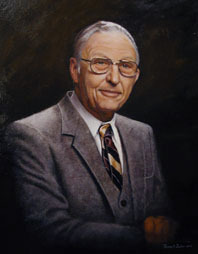 I've been painting oil portraits for over twenty years now, and they hang in public buildings and private homes throughout America. "What does a portrait cost?" Short answer: $5000 and up. 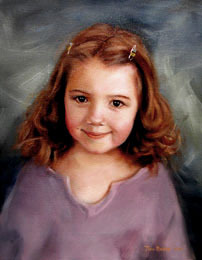 Portrait prices depend on how large and complex the composition is, and thus how long it will take to paint. 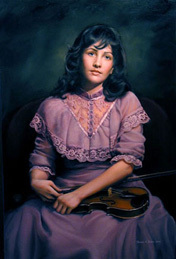 Factors that affect price are the number of people in the painting, whether the background will be simple or complex, and whether there are other elements such as pets, musical instruments, and so forth in the picture. 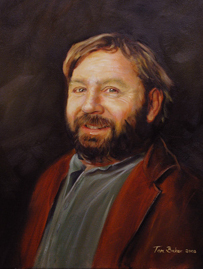 If you're interested in having a portrait painted, e-mail me with details of the sort of painting you have in mind, and we'll figure out what it would cost to have me paint it. Estimates are free. To give you some idea of the cost, I charge $5,000 for a 16 by 20-inch portrait of a single person from the waist up, with a plain background such as you see in the sample above, and in most of the portraits below. The same single-figure portrait done in a larger size, such as 24 by 30 inches (large enough to allow a nearly life-size face) would be $7500. 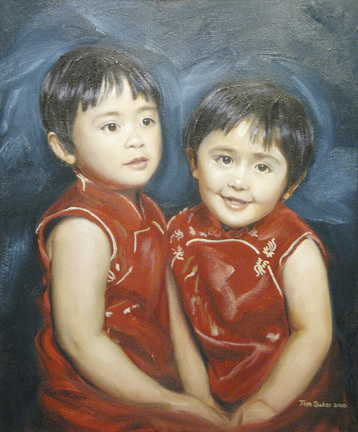 Most portraits nowadays are painted from photographs, rather than have the subject of the portrait endure long and tedious sittings in the studio, although if you wish to do it the traditional way I can accomodate you. I can also turn a favorite photo of yours into an oil painting, but I prefer to take my own photos under carefully controlled conditions. Typical snapshots of people are rarely suitable to paint from, though they can be used when nothing else is available. I have painted portraits of deceased persons from black and white photographs, and turned them into color portraits using their relatives' descriptions of such details as eye and hair color, but the best results come from good color photos taken under correct studio conditions. If you commission me to paint a portrait for you, and you don't have a photo of yourself for me to work from, then the best thing for you to do would be to come to my studio for a photo session. Another option would be for you to have a professional photographer of your own choosing take a picture of you that I could use to paint from. Again, e-mail me if you'd like to discuss the possibilities. There is no charge for consultations. The terms of a portrait are half the fee paid in advance, with the balance due upon completion and delivery of the portrait. The portrait is delivered unframed, unless you make special arrangements (and pay extra) to have me frame it for you. The client pays for shipping and insurance. 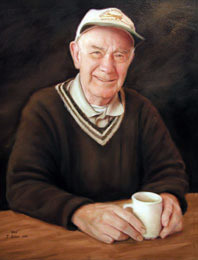 Portraits typically take three to six weeks to complete, depending upon their size, complexity, and my work schedule. 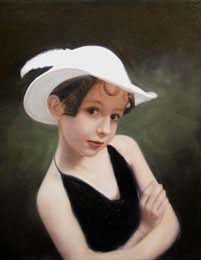 "Mary in a White Hat"